I admit that my Bi-Weekly Baking Bonanzas have been failing. Even when I manage to make them, I either don’t take pictures or I’m trying to rush through them. That is NOT what I wanted when I first set out to do this. These are the points I wanted to accomplish, and it’s unfortunate that I’m not succeeding as I had wished. 1. Read through the ingredient list and physically check that I have EVERYTHING in the proper amounts. * I’m doing okay at this, but honestly, I could do better — Half-Check. 2. Read through the instructions at least once before taking anything out. * Okay, I’m definitely doing this — Check. * Who am I kidding, I’m making just as big a mess every time. BUT, I’m getting better about washing my dishes when I’m done, but I think that also has something to do with there never being any room in the sink to just let them sit. — I’ll give it a Check for that. 5. Take LOTS of photos of the ENTIRE process, from start to finish. * Sometimes it happens, sometimes it doesn’t. I’d probably take more pictures if I had natural lighting in my kitchen, rather than the gross yellow overhead lighting — Nothing. 6. SLOW DOWN and ENJOY the baking process. * I wish I could give myself a Check for this, but I’m just so rushed lately — Check-minus. I honestly thought this whole process would be such a fun experience. I hate being wrong, but honestly, did I honestly expect to accomplish all this during the semester? I should have known that school and work would ultimately get in the way. Other things have gotten in the way too, and I should have known they would. I was SO optimistic at the start, but as the weeks go on and things don’t get done, that optimism wanes and that depresses me. It also doesn’t help that I don’t really have anyone to bake FOR. Okay, enough with the depressing stuff. On to the cupcakes. Unfortunately, this Bonanza truly embodied the rushed nature of my baking. On the spur of the moment late one Monday night I decided to bake these for a friend to either celebrate her becoming an RA or comfort her if she did not get the job. That’s one good thing about baking, it can be either for celebration or comfort, and you don’t have to change a thing in the recipe. 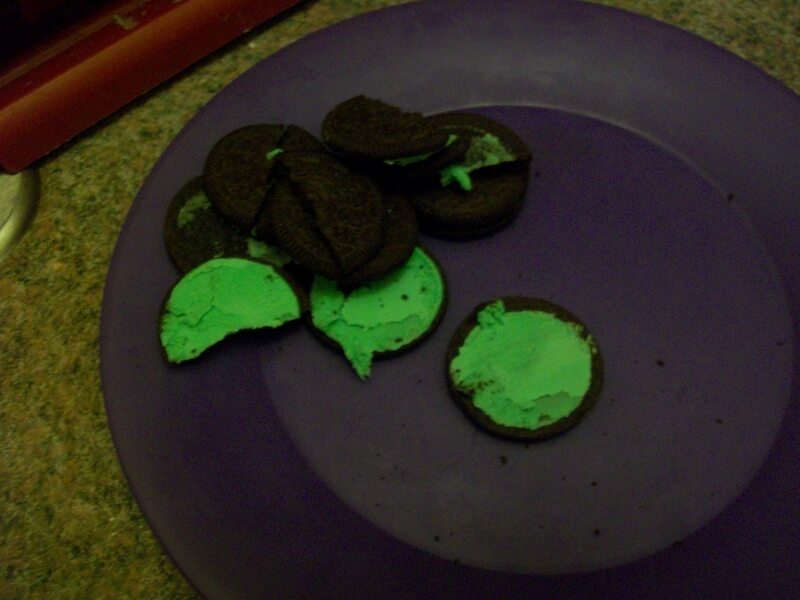 Let me just say that I was terrible at separating the mint Oreos. The cream was too squishy and so not many of the halves separated cleanly. 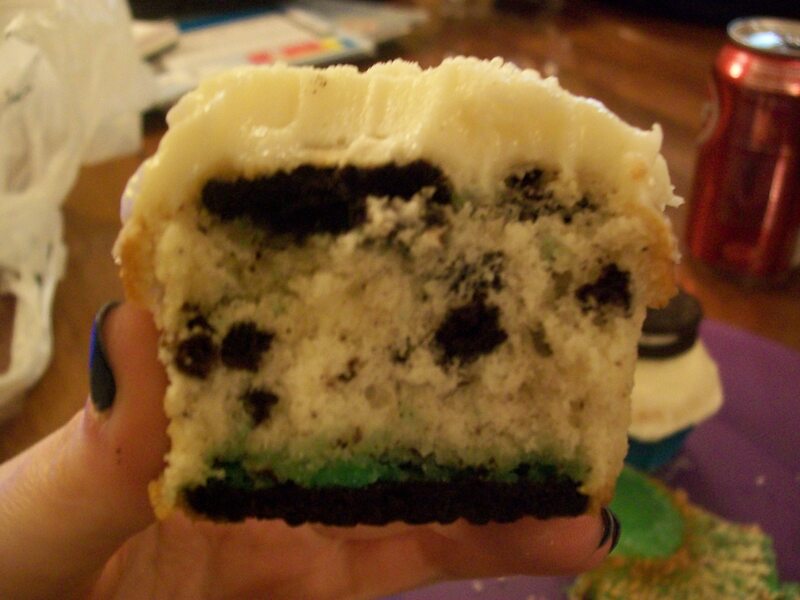 I did half mint-bottomed cupcakes and half double-stuffed bottoms. The purple and green are mint, and the red and blue are plain. I ended up crunching up the Oreos rather than just cutting them into big chunks, but I liked the outcome of how I did it. I know, I didn’t “follow the recipe” as it said, but oh well. They were still very yummy. They domed up and didn’t spread out over the tin, which really pleased me. 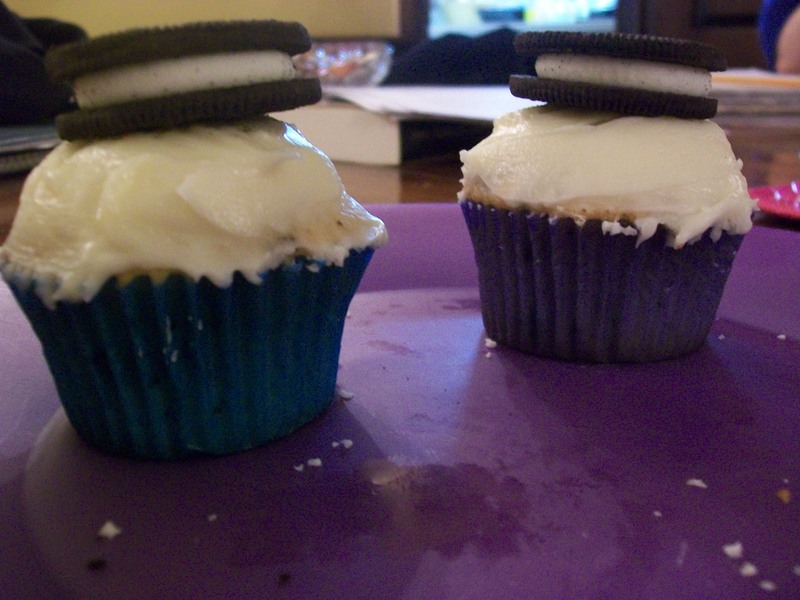 However, I should have known that the Oreos would stick to the liners because I didn’t spray them. 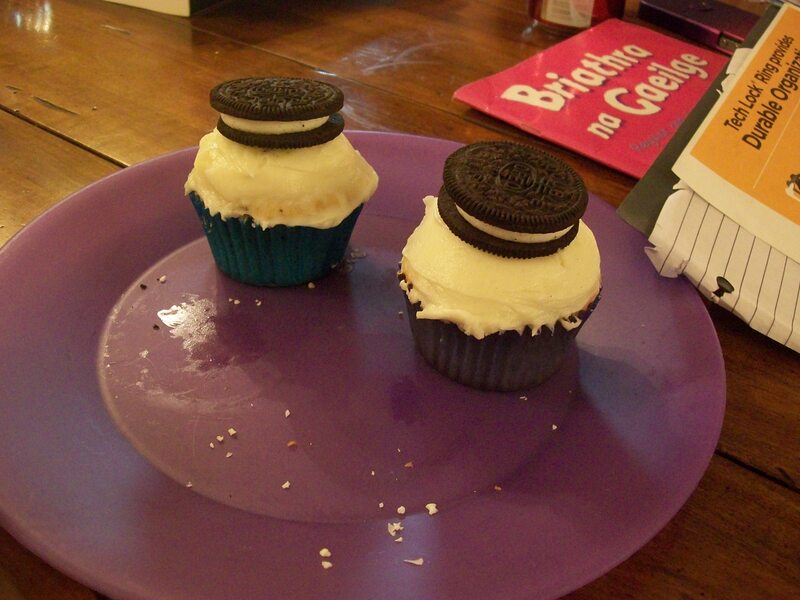 I may have consumed some wrapper with my cupcakes. 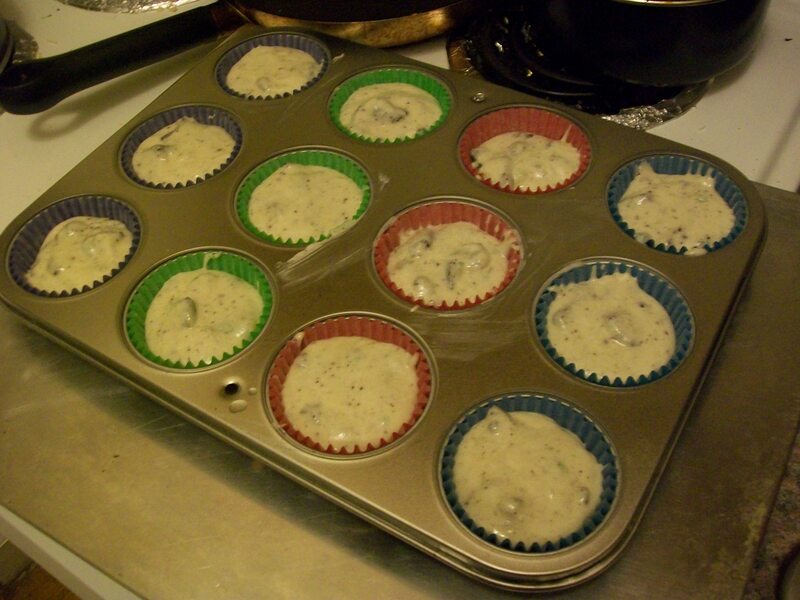 They turned out to be comfort cupcakes during lunch the next day. They cheered her up a bit, but she was still disappointed. Which would you rather eat? 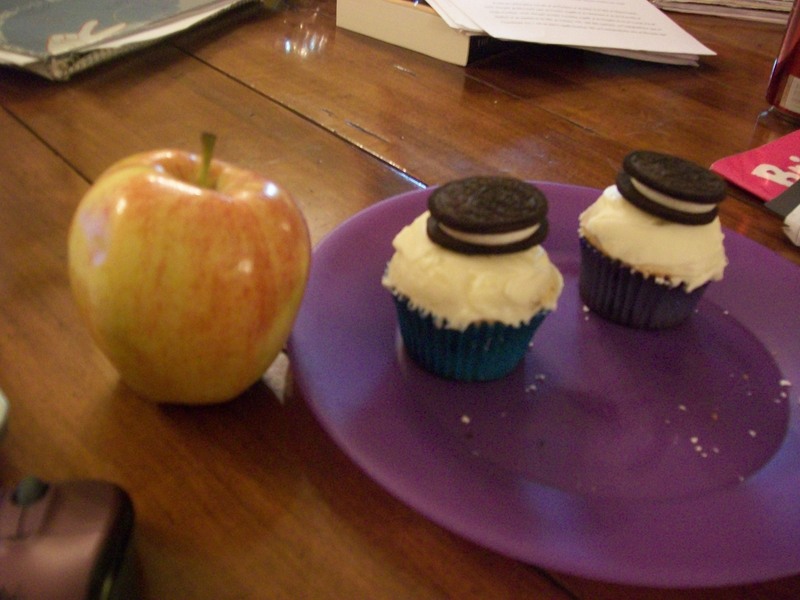 This gigantic apple or a cupcake? It was a hard decision, but I did eventually eat my apple. The cupcake may or may not have been consumed first. The point is that I DID eat my apple. In other news, HAPPY BIRTHDAY TO PAUL BYROM, my beloved Swanky Tenor.